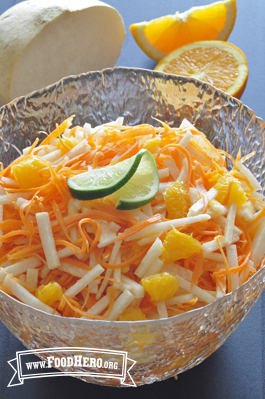 3 Comments for "Carrot, Jicama and Orange Salad"
Oh my! This is now a favourite salad! Will make this again. We have made this recipe many time we love it, but we left out the honey and the olive oil and insted we added some chilli powder and the kids love it. This salad is great without vegetable oil, too! I have also substituted turnips for jicama (since they are also white, sweet, and crunchy) and I can grow them in a garden.